Welcome to Wyndham Garden State College! From I-80 to Exit 161 (Bellefonte) follow PA Route 26 South. Route 26 South turns into Route 220 South. Follow Route 220 South for about 0.3 miles, then continue on I-99 South for 11 miles. Take exit 73 to merge onto US-322 East toward State College/Lewistown. Continue 6.5 miles to Elks Club Road. Turn left onto Elks Club Road and continue about 0.3 miles to Wyndham Garden State College. Make a left from the parking lot onto Fox Hollow Rd. Turn left onto Park Avenue. Take a right onto the ramp for US-322 East, continue about 6 miles. Turn left onto Elks Club Road. (92 miles) Follow the signs to Route 322/22 West. Take 322 West past Lewistown, to the Boalsburg exit. Turn right onto Elks Club Road. (@ 200 miles) Take Philadelphia Schuylkill Expressway to the PA Turnpike West. Take Exit 19, Harrisburg East, and follow the signs for the next 15 miles to route 322 West. (The actual route you will follow is: I-283 to I-83 North to I-81 West to 322/22 West) Take 322 West, past Lewistown, to State College. Exit at Boalsburg (also, Business Route 322 & Atherton St). Turn right onto Elks Club Road. (225+ miles) take the George Washington Bridge to I-80 West. Take Exit 161 toward Bellefonte and follow the above From the East directions. (@166 miles) Follow I-83 N to Harrisburg, take 322 W to State College. Exit at Boalsburg (Business Rt. 322/Atherton St.) Turn right onto Elks Club Road. (@ 125+ miles) Follow Route 22 East to Duncansville. Then take Route 220/I-99 North bypassing Altoona and Tyrone. After Port Matilda, take Route 322 East to State College. Exit on Business Route 322/North Atherton St. Continue on Atherton Street into Boalsburg. Turn left onto Elks Club Road. 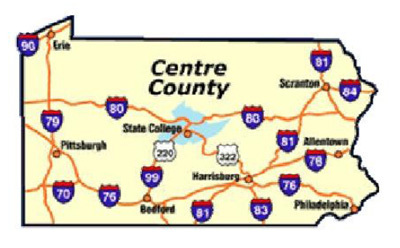 (@ 200 miles) Take route 270 to Frederick MD, then Route 15 North to Harrisburg, PA. Then take 322 East to State College. Exit on Business Route 322/North Atherton St. Continue on Atherton Street into Boalsburg. Turn left onto Elks Club Road.